Finishing the course on "Free Software and Open Standards"
A couple of months ago, I was invited to give the starting course for the Masters degree in Free Software in the Universidad Andina Simón Bolívar university. UASB is a multinational university, with campuses in (at least) Ecuador, Chile, Bolivia and Colombia; I was doubtful at first regarding the seriousness of this proposal and the viability of the program, but time made my doubts disappear. Bolivia is going through an interesting process, as they have one of the strongest worded government mandates for migration to free software for the public administration in the next couple of years; this migration has prompted the interest of many professionals in the country. In particular, we have over 40 registered people for this Masters degree. Studying a Masters degree is a long-term commitment which signifies a big time investment, and although many of the student are quite new to the idea of free software, they are willing to spend this time (and money, as the university is privately owned and charges for its enrollment). I gave this class together with Alejandro Miranda (a.k.a. @pooka), as we have a very good pair-teaching dynamics; we had already given many conferences together, but this is the first time we had the opportunity to share a whole course — and the experience was very good. We have read the students' logs, and many of them clearly agree with this. I had to skip two of the (ten) lessons, as I travelled from Mexico to Argentina halfway through it (of course, we brought the babies to meet my wife's family and friends! ), so we had also the honor of having Esteban Lima fill in for those sessions. We have yet another video file (which I have not fully followed through) titled ADSIB - Migration plan. It can also be downloaded from my server or watched online at Youtube. All in all: This was a great opportunity and a joy to do. I think the material we used and developed fit well what was expected from us, and we had fun giving somewhat heterodox readings on our movement. [Update]: UASB uploaded some extra videos, with a much better quality! I added them to the table above, specifying (Low) or High whenever needed. Also, all classes are now available. Enjoy! I know very little about hardware. I think I have a good understanding on many aspects of what happens inside a computer, but my knowledge is clearly firmer on what happens once an operating system is already running. And even then, my understanding of the lower parts of reality is shaky at most — At least according to my self-evaluation, of course, comparing to people I'm honored to call "my peers". During the last ~18 months, my knowledge of this part of reality, while still far from complete, has increased quite a bit — Maybe mostly showing that I'm basically very cheap: As I have come across very cheap (or even free for me!) hardware, I have tried to understand and shape what happens in levels below those where I dwell. I have been meaning to do a writeup on the MIPS Creator CI20, which was shipped to me for free (thanks++!) by Imagination Technologies; I still want to get more familiar with the board and have better knowledge before reporting on it. Just as a small advance, as this has been keeping me somewhat busy: I got this board after their offer to Debian Developers, and prompted because I'll be teaching some modules on the Embedded Linux diploma course dictated by Facultad de Ingeniería, UNAM — Again, I'll blog about that later. Today, the GPL sources for hub are available - at least the kernel and a patch for busybox. The proper GPL release is still only through written offer. The sources appeared online April this year while Hub has been sold for two years already. Even if I ordered the GPL CD, it's unlikely I could build a modified system with it - too many proprietary bits. The whole GPL was invented by someone who couldn't make a printer do what he wanted. The dystopian today where I have to rewrite the whole stack running on a Linux-based system if I'm not happy what's running there as provided by OEM. This is not exactly the situation on the boards/products (it's a disservice to call the cute CuBox-i just a board!) I mention I'm using, but it's neither too far. Being used to the easy x86 world, I am used to bitching on specific hardware that does not get promptly recognized by the Linux kernel — But even with the extra work UEFI+SecureBoot introduces, getting the kernel to boot is something we just take for granted. In the MIPS and ARM worlds, this is not so much of a given; I'm still treating the whole SPL and DeviceTree world as a black box, but that's where a lot of the work happens. The boards I am working on try to make a point they are Open Hardware. The CI20 is quite impressive in this regard, as not only it has a much more complete set of on-board peripherials than any other, but a wealth of schematics, datasheets and specifications for the different parts of its components. And, of course, the mere availability of the MIPSfpga program to universities worldwide is noteworthy — Completely outside of my skillset, but looks most interesting. However... Despite being so much almost-Free-with-a-capital-F, all those boards fail our definitions of freedom in several ways. And yes, they lead us to a situation similar to what Riku describes, to what Stallman feared... To a situation not really better to where we stand on openly closed-source, commodity x86 hardware: Relying on binary blobs and on non-free portions of code to just use our hardware, or at least to use many of the features that would be available to us otherwise. I have managed to do clean Debian installs on most of my ARM machines (the CuBox-i as described in my previous blog post; this post from Elena ``of Valhalla'' prompted me into trying the already well documented way of running the official Debian Installer, which worked like a charm and gave me a very nice and responsive Debian 8 install — Modulo yes, the Banana's non-free video interface, which AFAICT uses the non-free Mail binary driver... And which I haven't had the time to play with yet. Of course, my CuBox is in a similar situation, where it works like a charm as a personal server, but is completely worthless as a set-top box. Despite claims of being open source, this is not open source hardware. If you are thinking of getting this device, you should also try looking into the hardware from our Community instead. I shall keep posting on this topic. This weekend we took the kids outside for the first time (not counting, of course, visits to the pediatrician). We were quite anxious... Of course, they were born somewhat under weight and at 7½ months of gestation. But this Saturday we feelt adventurous, and took the kids out for a day among people! It might not sound like a big deal, but... Well, we took a not such beautiful or scenic route: We took them to the supermarket, and had a small lunch out. For the first time in the already two months they have been with us. Dinner with friends at home, having a very good time, and –as expected– a... Very hard night for us. All that excitement had the babies very nervous. Today –again, for the first time– we took the children out to visit some friends of ours. Again, it was great, they behaved very nicely, and were lovely all around. Lets see what this night holds in place for us. Anyway, with them growing slowly but steadily... We are very happy, thankful parents. For the first time since Regina is with me in Mexico, this time we decided we would not have a birthday party (yes, I'm 30 minutes away from being 39 year old). I cannot imagine a fuller, better celebration than what we are having. This two babies are the real event in our lives. 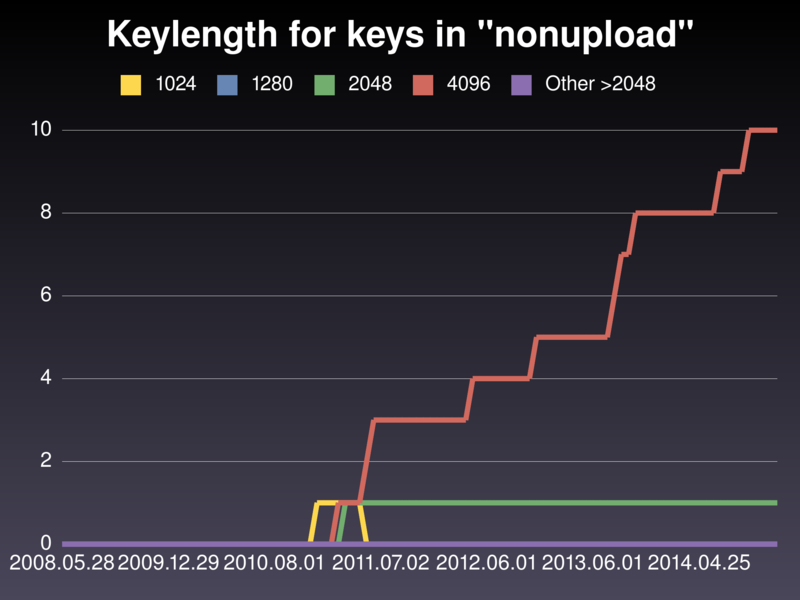 Status of the OpenPGP keyring: 1024D is a thing of the past! Having seen the end of December and the beginning of January, this is the time of year where we say "Happy new year!" But this is a very interesting new year: We have also went past our much announced deadline for the <2048 bit keys to be removed from the Debian keyrings. And yes, our highly efficient keyring-maint team managed to deliver on the promised time — And, I'd say, with much success. Lets see the numbers — Only before that, refer to Jonathan's mail to debian-devel-announce for further, fuller information. So, first of all, how do overall numbers look? 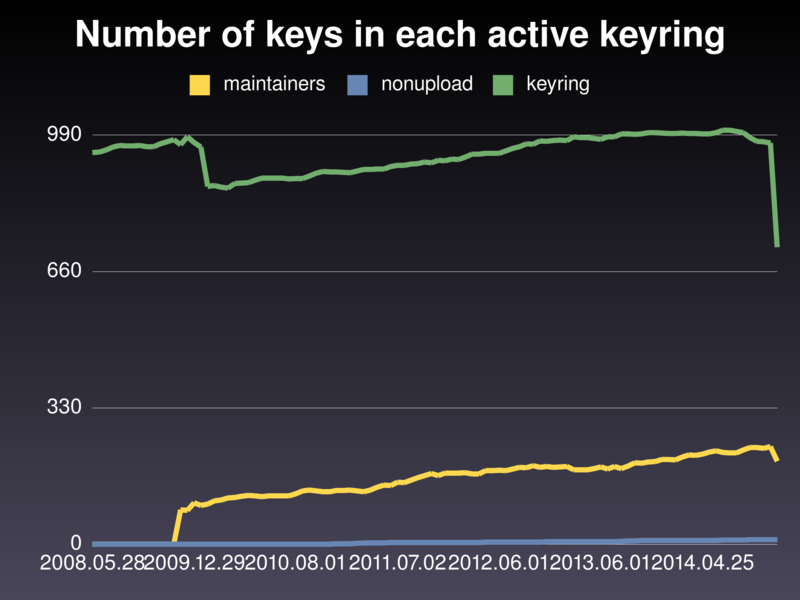 Just remember, the following are not the number of DDs, just the number of active keys. That is, the holders to the 252 DD and 35 DM keys we removed are still valid Debian Developers/Maintainers, but have to get a new key accepted to perform many of their tasks in the project. The graph above shows the sharp change between tags 2014.12.31 and 2015.01.01. But my definition of success is that we managed to get the number down to just 252+35=287 from what we had back in August, when we did our DebConf presentation and started the aggressive push: 490 DD keys and 49 DM keys. Since then, 34 DDs requested their retirement, becoming emeritus, and practically all of the rest managed to get their key transition done! As this is the newest keyring in existence, and is also the smallest one, we were already without <2048 keys since 2011. Nothing to see, move along. We did have a sensible migration from weaker to stronger keys, but it was not as sharp as I'd have liked. That makes sense, after all, since DMs have less involvement and compromise in the project in regard to DDs. So, we only processed 15 DM keys since August, which is almost a third of the keys we needed to process to reach the ideal 100% migration. And yes, here you can see the sharp turn we saw in the second half of this year: By DebConf time, we were happy because the red and yellow lines had just crossed. But we were still sitting at 490 DD keys needing to be migrated. Half of the DD keys (compared to almost a fourth for the DM keys). 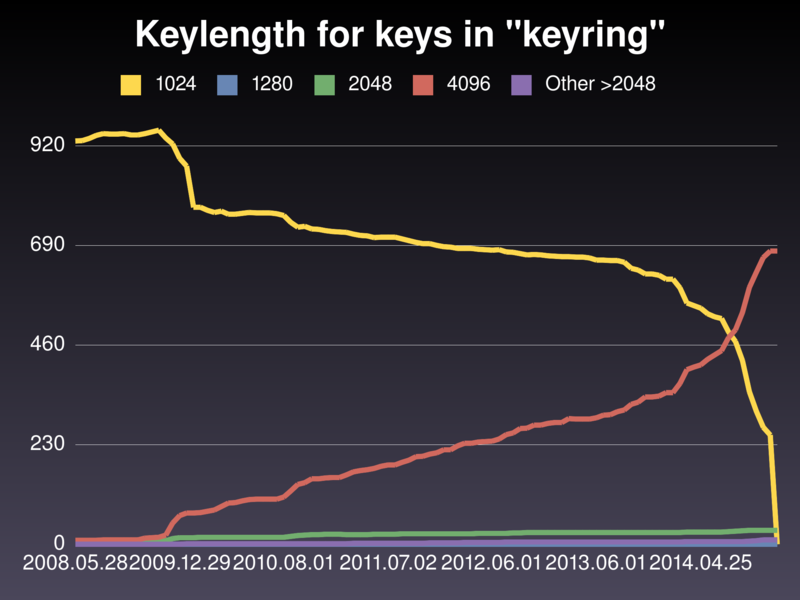 I'm almost sure we anticipated in our presentation (I know, I should check the video) that, by January 1st, we would have to retire around 300 keys. And I'm very, very happy and proud that we managed to get the number down to 252. And, yes, people leave things to the end: We already have some more pending requests in the Request Tracker to introduce new keys for our fellow friends who were disabled. We will be working to make keyring pushes more frequent than our usual monthly uploads until requests go back to a sane level. So, if everything runs smoothly, this will probably be the last of my posts in this regard. This has been quite an interesting (and exhausting!) experience! I have long wanted to echo Gregor's beautiful Debian Advent Calendar posts. Gregor is a dear project member and a dear friend to many of us Debianers, who has shown an amount of stamina and care for the project that inspires everybody; this year, after many harsh flamefests in the project (despite which we are moving at a great rate towards a great release! ), many people have felt the need to echo how Debian –even as often seen from the outside as a hostile mass of blabbering geeks– is actually a great place to work together and to create a deep, strong social fabric — And that's quite probably what binds the project together and ensures it will continue existing and excelling for a long time. As for the personal part: This year, my Debian involvement has –once again– reduced. Not because I care less about Debian, much to the contrary, but because I have taken several responsabilities which require my attention and time. Technically, I'm basically maintaining a couple of PHP-based packages I use for work (most prominently, Drupal7). I have stepped back of most of my DebConf responsabilities, although I stay (and will stay, as it's an area of the project I deeply enjoy doing) involved. And, of course, my current main area of involvement is keyring-maint (for which I have posted here several status updates). I have to say that we expected having a much harder time (read: Stronger opposition and discussions) regarding the expiry of 1024D keys. Of course, many people do have a hard time connecting anew to the web of trust, and we will still face quite a bit of work after January 1st, but the migration has been a mostly pleasant (although clearly intensive) work. Jonathan has just told me we are down to only 306 1024D keys in the keyring (which almost exactly matches the "200-300" I expected back at DC14). Anyway: People predicting doomsday scenarios for Debian do it because they are not familiar with how deep the project runs in us, how important it is socially, almost at a family level, to us that have been long involved in it. Debian is stronger than a technical or political discussion, no matter how harsh it is. And, as a personal thank-you: Gregor, your actions (the GDAC, the RC bug reports) inspire us to stay active, to do our volunteer work better, and remind us of how great is it to be a part of a global, distributed will to Do It Right. Thanks a lot! The line of BASIC code that appears as the subject for this post is the title for a book I just finished reading — And enjoyed thoroughly. The book is available online for download under a CC-BY-NC-SA 3.0 License, so you can take a good look at it before (or instead of) buying it. Although it's among the books I will enjoy having on my shelf; the printing is of a very enjoyable good quality. And what is this book about? Well, of course, it analizes that very simple line of code, as it ran on the Commodore 64 thirty years ago. 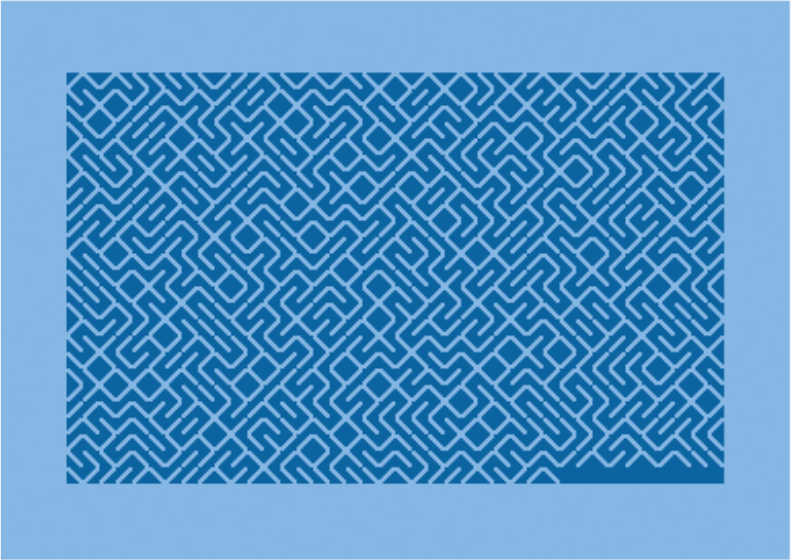 And the analysis is made from every possible angle: What do mazes mean in culture? What have they meant in cultures through history? What about regularity in art (mainly 20th century art)? How would this code look (or how it would be adapted) on contemporary non-C64 computers? And in other languages more popular today? What does randomness mean? And what does random() mean? 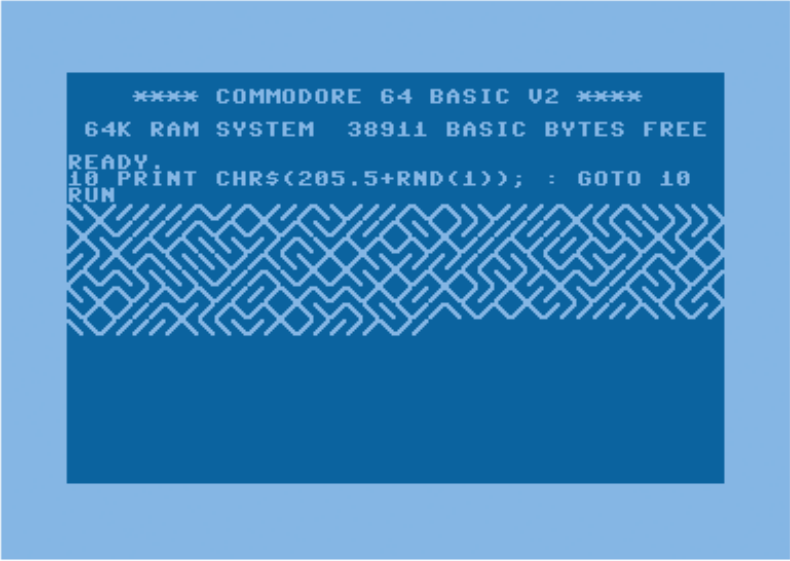 What is BASIC, and how it came to the C64? What is the C64, and where did it come from? And several other beautiful chapters. The book was collaboratively written by ten different authors, in a Wiki-like fashion. And... Well, what else is there to say? I enjoyed so much reading through long chapters of my childhood, of what attracted me to computers, of my cultural traits and values... I really hope that, in due time, I can be a part of such a beautiful project! 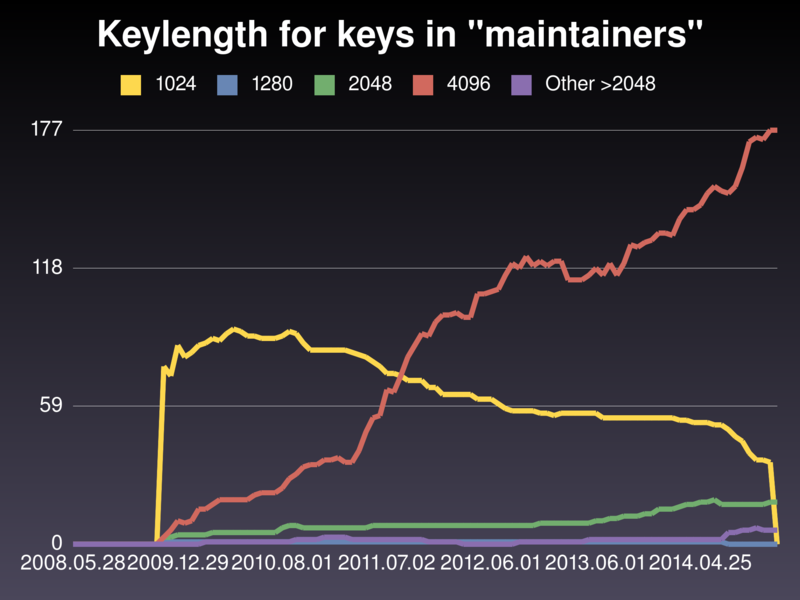 Almost two months ago I posted our keyring status graphs, showing the progress of the transition to >=2048-bit keys for the different active Debian keyrings. So, here are the new figures. 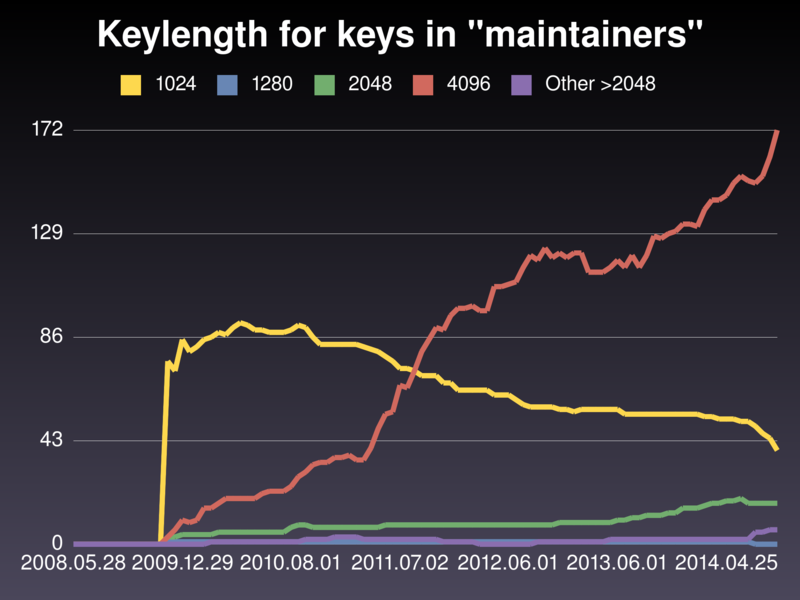 As for the Maintainers keyring: We can see a sharp increase in 4096-bit keys. Four 1024-bit DM keys were migrated to 4096R, but we did have eight new DMs coming in To them, also, welcome \o/. Sadly, we had to remove a 1024-bit key, as Peter Miller sadly passed away. 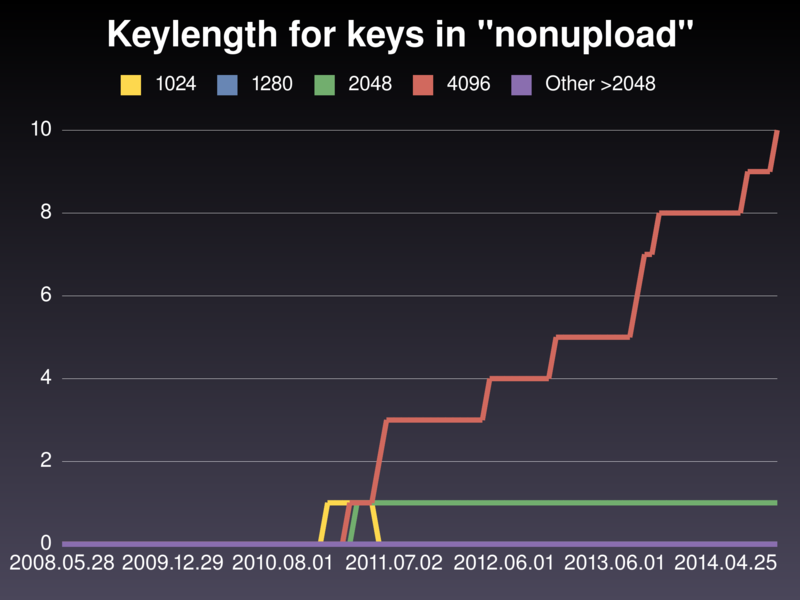 So, in a 234-key universe, 12 new 4096R keys is a large bump! Finally, our current-greatest worry — If for nothing else, for the size of the beast: The active Debian Developers keyring. We currently have 983 keys in this keyring, so it takes considerably more effort to change it. But we have managed to push it noticeably. 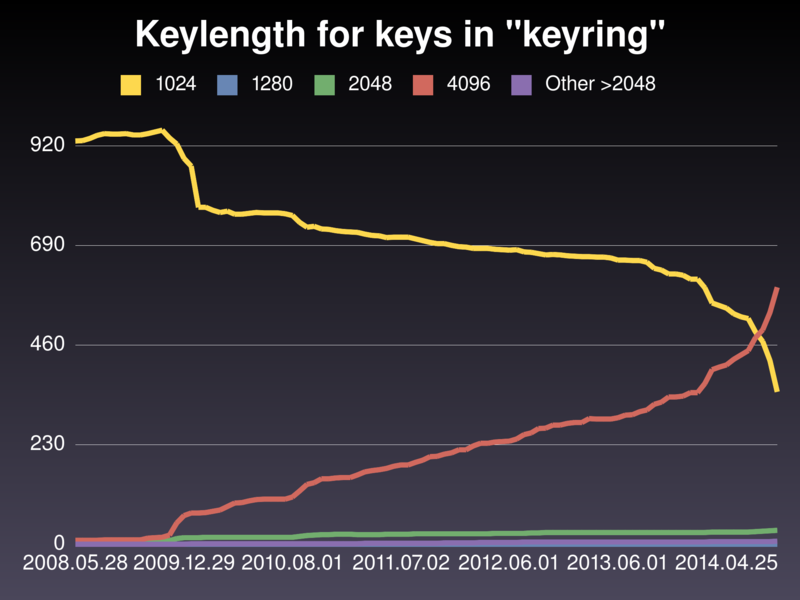 We still have a bit over one month to go for our cutoff line, where we will retire all 1024D keys. It is important to say we will not retire the affected accounts, mark them as MIA, nor anything like that. If you are a DD and only have a 1024D key, you will still be a DD, but you will be technically unable to do work directly. You can still upload your packages or send announcements to regulated mailing lists via sponsor requests (although you will be unable to vote). So, as of mid-October: 387 out of the 482 votes (80.3%) were cast by developers with >=2048-bit keys, and 95 (19.7%) were cast by short keys. So, lets hear it for November/December. How much can we push down that pesky yellow line? Disclaimer: Any inaccuracy due to bugs in my code is completely my fault!